As University students looks forward to resumption, FUNAAB is working assiduously towards expanding Information and Communication Technology facilities to the members of staff and students of the University. 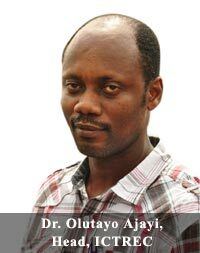 According to Dr Olutayo Ajayi, Head, Information and Technology Resource Centre (ICTREC) FUNAAB is on the verge of linking up with other Universities to provide the Students’ Centric Application that will enhance their academic pursuits and the University’s strive at attaining the world-class status. Dr. Ajayi added that Management had provided students with smart cards which will be used for access control during lectures and had also introduced the inclusion of official e-mail addresses, on the platform of Google, for easy correspondence. The Head of ICTREC also revealed that Management would soon provide document digitalization and presentation that will enhance deliberation at meetings and when in place, it will drastically reduce the use of bulky papers at meetings. He added that members of staff would equally be provided with the high quality Senior Smart Identity Cards that are used globally.